As a child I looked forward to getting that Easter Basket full of candy. Nothing better than a gift, especially candy, when you're a child. All that candy gave me the energy to survive having to dress "special" for church, set through an extra long worship service, and eat with family members you might only see once a year, often ending in arguments on religious teachings. Children across the globe have no choice but to absorb the culture and teachings pounded into them. They absorb them like a sponge. The Christian vs. Muslim conflict we know today is the result of that. So as a child, I believed in the Easter Bunny and the Resurrection of Jesus Christ with that sublime blind faith on the same day. It was magic! I pulled a rabbit out of a saviors crown of thorns. As my rebellious teen years set in...and not one to shy away from controversy, I began to question everything I was taught about religion. Questioning is the first order of learning. A gift that keeps on giving, whether that would be more knowledge, a black eye...or more than likely both. 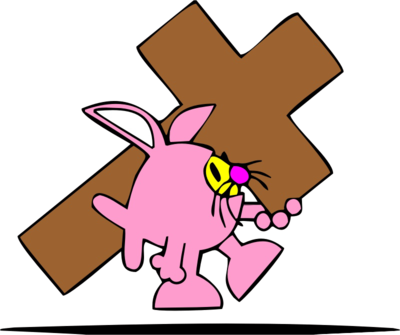 By the end of my teens I didn't believe in the Easter Bunny or cared much for the strict religion taught at my church. My college years began to open doors to a freedom of thought I never experienced before. Different ideas, different religions, different races and cultures, far removed from that small Southern Illinois community that formed me as a child. I once again opened up my mind and soaked in all that knowledge like a sponge. Then came the mother of all classes to fulfill my history minor...the History of World Religions. I was floored to learn the similarities between ancient (which many call Pagan) and modern religions, the plundering of ideas and theologies from one to the other. I began to see religion as both totally useless and the fulfillment of human desire since the beginning of time. I began to see the common thread that united them all. I began to see how religion is used to control others, or as a way to free the seeker on his spiritual journey through life. I became like a Pulsar, bouncing from one extreme to the other...almost ready to explode as I assimilated the facts learned in the class with the ideology I was taught during my first 18 years on the planet. That began a period where I made reason over faith my religion. Factual knowledge, based on historical evidence. All major religious celebrations are rooted in the astronomical calendar, and have been borrowed and modified for literally thousands of years be succeeding civilizations. Zoroastrianism, teaching "One God" of the ancient Babylonians, and the battle between good and evil, became the basis of the Judeo-Christian and Islamic theologies that we know today. In 325AD the Council of Nicaea of the Roman Catholic church, incorporating an already established Pagan spring festival calendar, established that Easter would be held on the first Sunday after the first full moon occurring on or after the vernal equinox. From that point forward, the Easter date depended on the ecclesiastical approximation of March 21 for the vernal equinox. Therefore, Easter is never on the same date, or even month from year to year. The story of Easter is as much rooted in paganism as it is in Christianity. The holiday owes its name to Eostra, the Germanic goddess of spring and fertility. The egg and the rabbit symbolized the coming of new life and fertility. An Easter Bunny character first hopped up in the 8th century. Legends featuring bunny imagery associated to Easter continued to be written down in 1500s Germany and the first story about a rabbit hiding eggs in a garden was published in 1680. As many Southwestern German immigrants settled in America, the Easter Bunny lived on in Pennsylvania Dutch tales of the Bunny as the "Oschter Haws," where Germantown children were gifted with eggs in their Easter bonnets that, today, are replaced by Easter baskets filled with candy and toys. Egg decorating is at least a 60,000 year old activity, practiced by the likes of Egyptians, Persians, Greeks and Kalahari Bushmen, who engraved ostrich eggs. Before giving colored eggs found its way into the modern Christian tradition, early Mesopotamian Christians dyed eggs red to symbolize the blood shed by Christ during his crucifixion. To join together as a community with a common cause. This day after Easter I am reminded of my college history professor saying, "It's a terrible thing to be young and stupid." I'm also reminded of what my priest said at Mass yesterday, "Easter is not about focusing on a life after death or the miracle of the cross, it's about giving us hope to focus on living life to it's fullest right now." I realize that reason and faith can coexist, that humanity and divinity are one, that we are all united through our diversity. I am resurrected every day...every moment...every opportunity to connect and engage the world around me. I am unified with all the living souls who have lived before, during, and after my brief existence here. I smile as I see children grabbing their Easter Baskets and begin their journey of discovery just I did those many years ago.